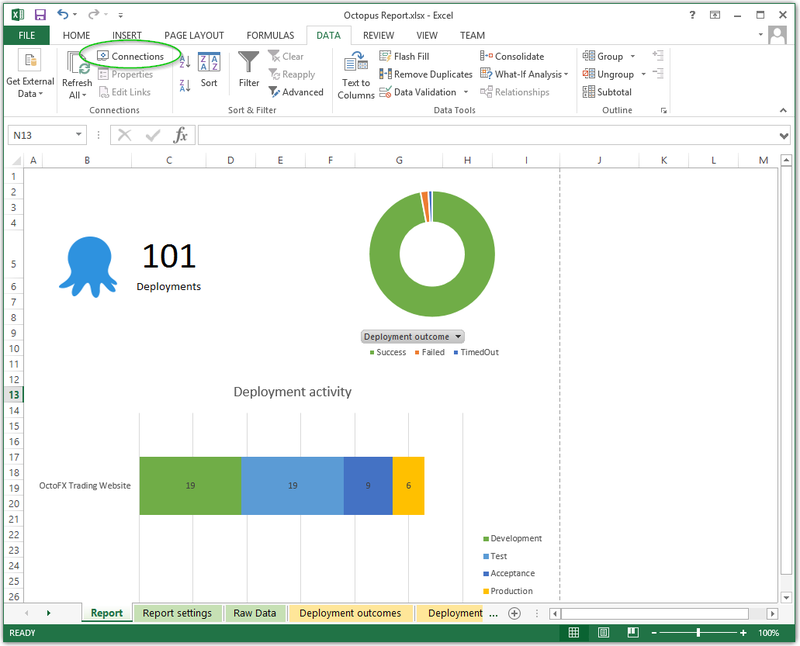 Octopus 3.1 added a reporting feature that makes it easy to produce reports over your deployment history, using your preferred reporting tools. Currently Octopus doesn't display this reporting data in the user interface anywhere, but we do expose raw data that you can query or consume in your favorite reporting tools. Hopefully, you'll be able to import this data, combine it with data from other sources, and slice and dice it in ways that make the most sense to you. An an XML feed, which can be consumed by tools like Microsoft Excel or PowerBI (preferred), or programmatically. As a table in the Octopus SQL database. 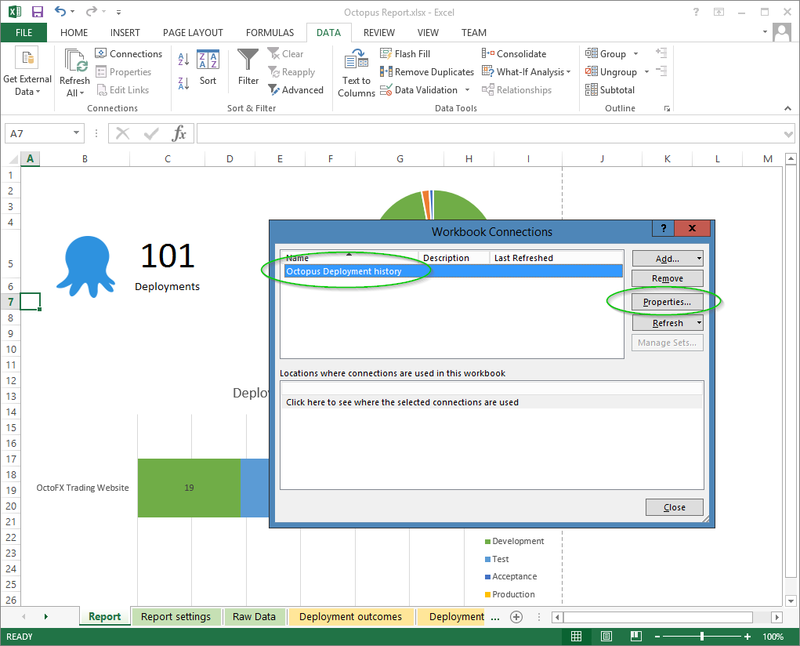 The fastest way to get started is to use our Excel spreadsheet template. The spreadsheet uses Pivot Tables and Pivot Charts to summarize the data. You can use it as a starting point, and then modify or adapt it to suit your needs. 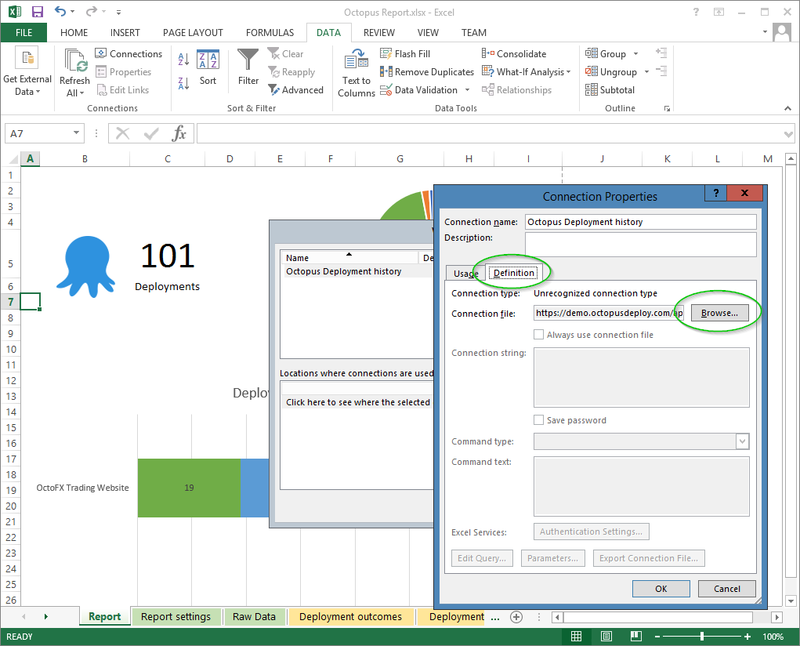 First, download the template and open it in Excel. 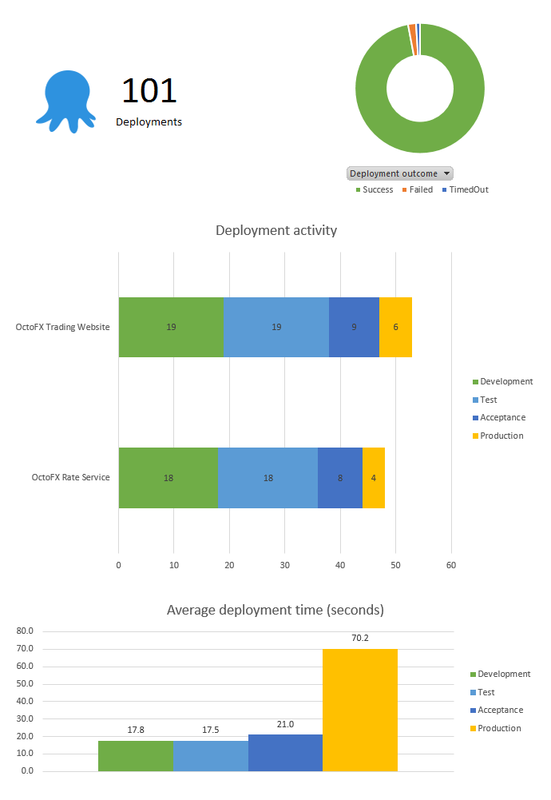 The template fetches data from our public Demo Octopus Server. 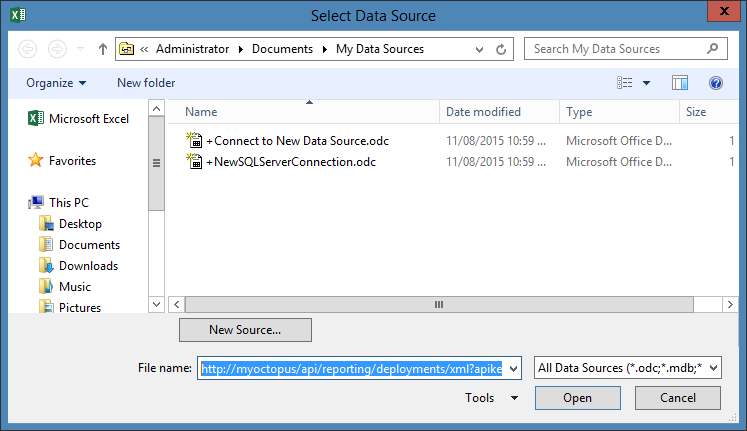 In the Select Data Source menu, instead of selecting a file, enter your reporting URL, then Open. To get your reporting URL, see the section below on Using the XML Feed. Once you have set up your connection, you can refresh the data from the source whenever you like. If you make your own customizations to the spreadsheet, you can save them, and simply refresh the data in the sheet whenever you like. The XML feed can be consumed programmatically, or via Excel or Microsoft PowerBI. Since a user-specific API key is used to consume the data, only data that the user can see will appear in the report. Fill in your URL in the Link or File: field. This should give you a Security Alert "Revocation information for the security certificate for this site is not available. Do you want to proceed?" Cancel the File Open dialog. Cancel the Data Connection Wizard. Paste the URL in the File Name field. If your reporting tool of choice can't consume the XML feed, you can query the SQL table directly. Octopus maintains a DeploymentHistory table, with the exact same information that the XML Feed exposes. This may work better for tools like SQL Server Reporting Services. We may add additional columns in the future. 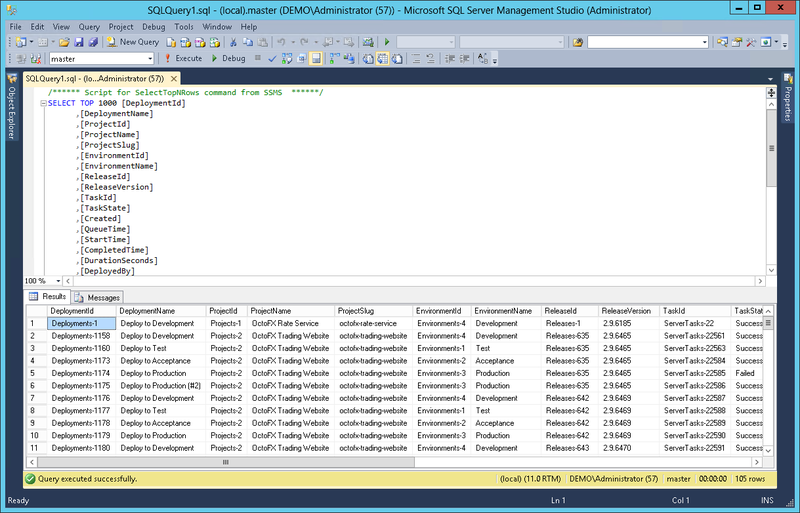 We'll try not to change existing columns, but just in case, you may wish to set up your own View in SQL server to provide an abstraction layer. Since you're accessing the data directly, be aware that Octopus team permissions won't apply. Don't join with any other tables - these are much more likely to change in future, so you're on your own if you do! The table is completely denormalized, and should have any information that you might need to report on. The data in the table (and exposed by the feed) updates every 30 seconds to add deployments that have recently completed. Since the data is denormalized, changing the name of a project or environment, or changing the version number of a release, may result in stale data. Octopus corrects this every 24 hours on a schedule. Isn't deleted by retention policies, so you can report on historical deployments even if retention policies clean them up. Isn't deleted when a project/environment is deleted. What About Information On Concurrent Users, Web Front-end Performance, etc.? You may want to look at enabling HTTP logging.